I hit day 100 on skis for the winter this morning. It was a loose goal that I set back in October that gained steam as the year progressed. As I have elaborated earlier, it's not that big of a deal for a true ski bum who works at the resort on a daily basis, but as somebody who works full-time down on the flats, it's something I'm stoked about. Looking back at the year, it seems like a long time ago – October 30 to be exact – when Elaine and I donned skis at Loveland Basin for the first turns of the year on a single, machine-made trail of white. It feels like there has been a ton packed in there between, and I think the memories of that are what truly matters. That said, as somebody who might externally give the impression of not caring about numbers – well, it drove me. To ski 100 days in an average winter requires, out of necessity, getting out there about five days of seven per week. I wouldn't call it a work-man-like attitude, because after all it's just skiing, but you do have to be committed to getting after it. When you have limited hours in the day to ski, as a result of work, it requires some early mornings when you'd much rather stay in bed, but saying, OK – this hurts and boy is it cold out – but I want, or maybe need, to ski. I would say that 100 days out there does not, in general, lead to better skiing experiences. The epic powder days, and the slightly sub-epic days – well, you'd be out there anyway. What I have found however is that it leads to a more complete winter experience. It's almost like living with a girl versus just dating her. You see all sides of the picture, and if it's true love, the whole picture – some might call it the flaws – just enhances the brilliance. 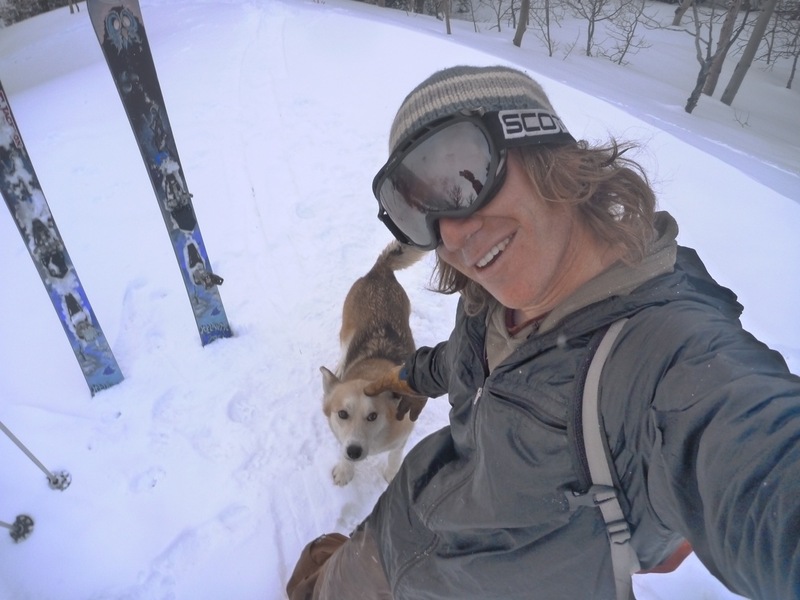 I skied more "crappy conditions" than ever before this year (with the exception of high school, the last time I was regularly skiing 100 days) – lots of wind crust, bullet proof hard pack, breakable crust, slop, rocks, and everything in between. Of course there were those days in January and February and even as recently as Thursday where there were the glory conditions – the powder that allowed you to ski the line EXACTLY how you wanted. But there was also that day in December where the wind was whipping at 60 miles an hour at 6 am and I had a probation meeting at 8 am. It was so cold, it literally felt like my brain was freezing. But when I walked into that office at 8 am, a place where life seems void and individuality stifled, I felt like I had won a major victory. Today was a quintessential 100 day season day. It snowed a bunch yesterday but it went absolutely nowhere. MAYBE an inch of dust on a very hard crust. I got a pair of ski crampons the other day and decided to scale straight the heck up my normal run. A little training for couloir skiing in May and June. A thousand vertical in less than a mile, with sections bordering 40°. I went anaerobic and had to stop a few times. Ouch. Thank goodness for the crampons. They didn't exactly make it a chairlift ride, but they did make it barely doable. Got to the top, and kind of enjoyed some time with Stella, just kind thinking about the year – running the calendar through my head – the shallow snow yet undeniable stoke of October and November, the outstanding winter bliss of December (I think December is my favorite winter month), the cold days of January, the powder of February, the variability of March. Lots of memories melded into the head, yet still individual enough to find a place. I think…of those Aspen trees at dawn, the red sheen of the sun glowing through their individual tentacles. Or Elaine's stoke finding the sport she grew up on again, finding her wings, and smiling. Or Stella, who knows the lines by now as well as I do, flying down with a smile as big as Alaska on her face. I think of the wind, the cold, the fast skin tracks, the breaking of trail…the whole shebang. It has been a good winter, not necessarily because of the best days, but actually because of some of the comically worst. Or I guess, the all encompassing big picture. Back down the hill. 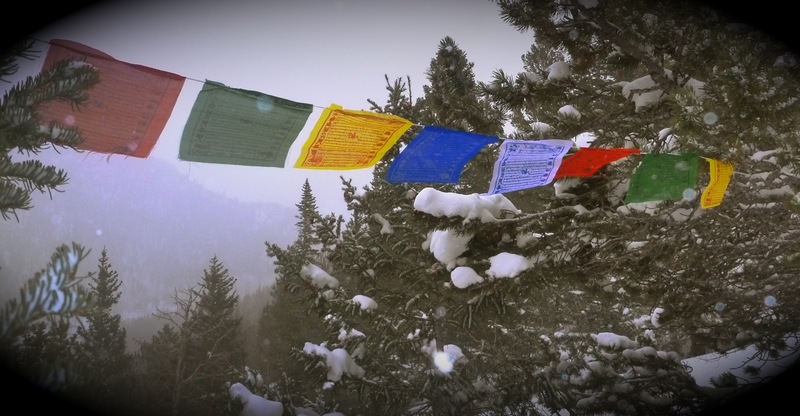 Through the glades, under the prayer flags and down the "face." Icy as heck, making tight turns, but then there was the glorious one inch on top, the sluff, that feeling, however fleeting, of making a turn that just fit. Down through some breakable crust, skiing it with a solid hop to avoid any entanglements, and then through the trees back to the car and home. Day 100. It's a skiing lifestyle. Where do we go from here? Well, honestly, I'll probably ski. As early as tomorrow morning. The trails for mountain biking are still snowy, and besides that, there are few things I like better than starting the morning going up, catching the sun rise over the eastern horizon, and ending it with a few turns down where I feel as close to a hawk or eagle as is possible. Standing on top, and then skiing down, the problems of the world are far below, and I think us human beings are doing something that is ancient and very much the core of our existence. Yours is a strange and wonderful world. Thanks (as always) for the erudite glimpse inside.